los angeles county – Concrete Contractors, Concrete Construction, Concrete Paving | Bernardo Concrete Inc.
For the past four months Bernardo Concrete Inc. has been working, on and off, in Whittier, California constructing all concrete aspects of the new Molokan Church on Pioneer Boulevard. This project consisted of the buildings concrete slab footings, concrete ADA ramp, concrete slab parking lot, concrete walkways, and even colored and design oriented concrete walkway in front of the church. For those of you that find regular plain gray concrete to be boring, we do all forms of colored and texture designed concrete as well. At this particular job location, we formed and stamped a terracotta colored concrete walkway at the entrance to the church. This service is perfect for those remodeling driveways, patios, backyards etc. to achieve a nice artistic look. 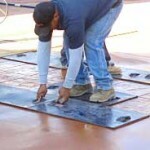 As you can see from the photographs the stamp we used for this concrete slab was a rock imitating pattern. This is a way to show a more diverse form of a simple colored concrete slab. 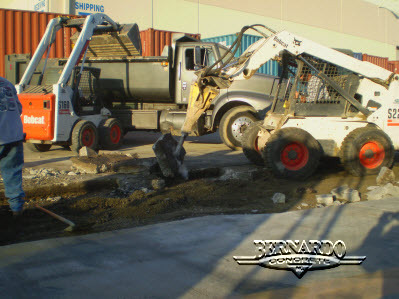 Bernardo Concrete has been installing concrete for over 20 years now. That gives us the wisdom & experience of time and we like to think that it shows in our work. We specialize in industrial, commercial, retail and residential concrete services. We are always looking for a challenging concrete construction project to do, so let us know if you have one by calling Toll Free 888-499-0899. We offer many concrete services including concrete demolition, concrete removal , curb & gutter installation and repair, handicap concrete ramp repair and installation (to ADA code), block wall installation and repair, concrete demolition, core drilling and saw cutting, and many more. There are just too many services to mention all of them so, take a look at our website by clicking on any of the links within this blog or start at the services page to navigate to any one of the specific services detail pages. We are located in Orange County California and service the surrounding areas including parts of Los Angeles, Riverside, and San Bernardino. If you have a project that requires a concrete contractor, then give Bernardo Concrete a call today and we will get an estimator out to your business for a fast, free and competitive quote. 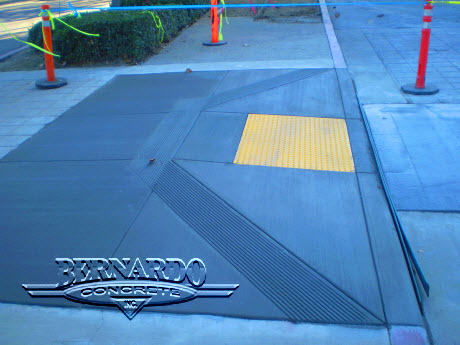 Bernardo Concrete offers many different types of concrete services consisting anywhere from a driveway approach replacement, curb and gutter construction, grading and paving, to handicap ramp and ADA upgrades. Most of the services we offer do need some form of concrete repair. Just last week we were scheduled to do some concrete removal and replacement work at an industrial building in Compton, CA near and around Carson, Gardena, Lynwood and Paramount. The process for this concrete repair deals with removing and replacing the existing concrete slab. In order to do so, first we saw cut out what needs to be removed. Then we begin to break and remove the concrete with our bobcats. Soon after the existing concrete is removed we haul it away to the nearest dump. The last step in this concrete repair process is to fill and pour the new concrete. In order for this concrete repair process to be complete and have met the standards of our customer we always make sure the area is left clean and looks even better than before.